StartPageing123 is a browser hijacker, and definitely not a genuine search provider, so if it is ever set up on browsers, go to delete StartPageing123 without further consideration. This website has been categorized as a browser hijacker because it shows up on web browsers and then changes users’ homepages and search providers to StartPageing123 without permission. After doing that, it starts performing activities it is programed to do. 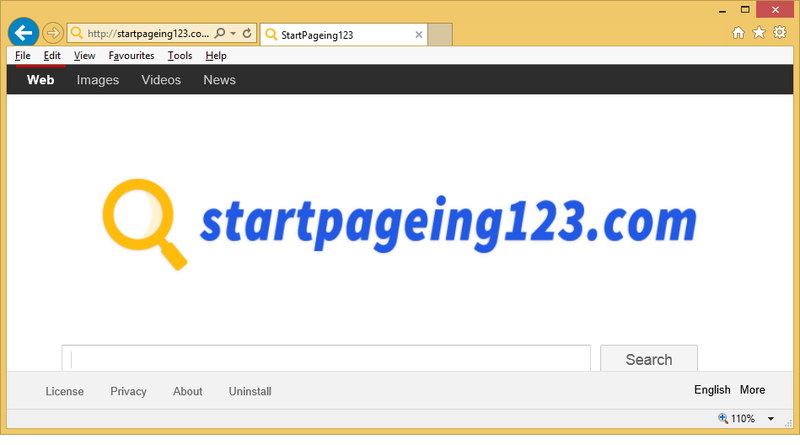 Users make complaints that they see commercial advertisements when they use StartPageing123 to search the web, so, despite the fact that it looks quite decent, it cannot be called by any means a trustworthy search provider. Uninstall StartPageing123 today to avoid problems the presence of commercial advertisements might cause. We will help you to implement the StartPageing123 removal here. StartPageing123 is a typical browser hijacker, so it always shows up on browsers without permission. Users see it when they open their browsers, i.e. every day, so the majority of victims of this browser hijacker use it as a default search engine. Keep in mind that it only pretends to be a genuine search tool. Its main goal is to generate money through online advertisements. The developer of this search tool, Polarity Technologies Ltd, gets money for users’ clicks on these commercials, so it is not surprising that they appear everywhere. They might show up on the first page of StartPageing123, but, as has been noticed, their usual place is the search results page opened by StartPageing123. Users who click on these advertisements might encounter serious malicious applications one day. They might be hiding on third-party websites they will be taken to after clicking on ads. Problems associated with the online privacy might quickly arise too if users keep visiting third-party pages promoted by StartPageing123. We hope that you have understood that the StartPageing123 removal is the best choice. How did StartPageing123 browser hijacker enter my system? The most commonly used method to spread browser hijackers is, of course, bundling, but we cannot guarantee that StartPageing123 has entered your system in a software bundle this time because there are many other methods too. The only thing is known for sure – it has appeared on your computer without your knowledge. Other threats might not ask your permission to enter the computer either, so go to install a security application. If it is kept enabled, any malicious application, no matter how dangerous it is, could not enter the computer. How can I remove StartPageing123 from my browsers? Users can go to set a new homepage and search tool on their browsers. StartPageing123 will no longer be visible if they do that, but the problem is that users find it quite hard to delete StartPageing123 manually. In this case, malware experts suggest using a legitimate anti-malware/anti-spyware scanner. It is the easiest method to remove StartPageing123, but users should understand that there are hundreds of fake tools on the web which are completely useless. Some of them are also developed by cyber criminals to spread malware or get money from users.